Swatching serves many purposes in knitting. There is the basic gauge swatch, which should (in theory) help the knitter pick the correct needles to go with a given yarn for a specific project. That is a story often told in many places, with many associated difficulties and the lament that swatches lie. That’s as may be, but it’s not the focus of this post. For designers of finished objects like sweaters or socks or shawls, swatches serve other functions aside from measuring gauge. They can be used to work out the transitions between a stitch pattern and a ribbing, to figure out which buttonhole is best for a given situation, to decide which complicated lace looks best with which simple mesh. These swatches can be quite large by comparison with the gauge swatches that most knitters make. 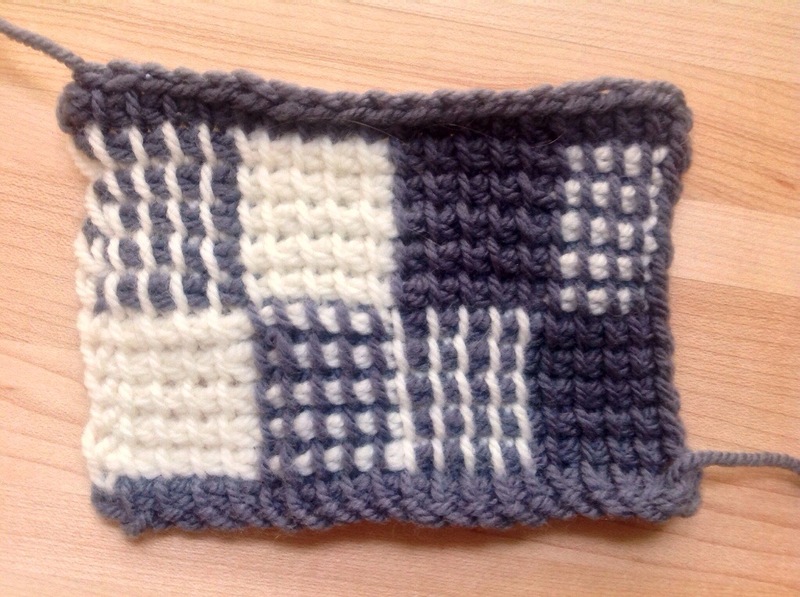 Another kind of swatch is one that I like to use: a practice swatch to learn a new technique before incorporating it in a finished object, or to see if that mistake from a work in progress could actually be used as a purposeful technique. Here the swatch only needs to be as many stitches as it takes to work the new method. I’ve been playing with an idea. This isn’t it exactly, but it’s a sneak peek of something related.